Casablanca is the largest city in the Maghreb, with almost 4 million inhabitants. Since the nineteenth century, it has grown steadily and is today the first business center, the first port, the first financial center and the first university center of the country. 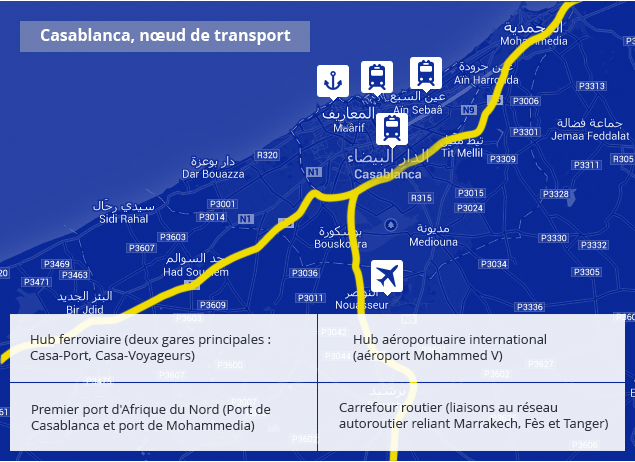 Casablanca is the city of business par excellence, a place of passage for all Morocco. With its international airport serving most of the world’s major cities, its commercial port, its numerous banks and financial services, Casa represents 65% of the country’s economic market. The first major modern port of the Kingdom was built in Casablanca in 1912. This historic turning point affected in many ways the destiny of the city. The whole of the economic development of the region, intensified by the port activity, drained in particular the national and foreign investments. This gave birth to the economic capital of the Kingdom, dynamic and modern, that we know today.